The 2019 Ford Ecosport is going to be the smallest crossover in the family. Slotted under Escape, it will offer generous fuel economy and incredible handling. With plenty of options and unique solutions, it is not strange why this small model is so popular. People love power and aggressive appearance. The Ford Ecosport is not offering that, but sporty driving position and maneuvering. After the experience with Ecosport, no other SUV can offer the same impression. Crossovers are the most popular vehicles nowadays. In this segment, compact and mid-size classes are selling more units than other tiers. That is the first problem the 2019 Ford Ecosport will have to cope with. It can’t be as popular as its bigger siblings. For a couple of thousand dollars more, buyers can get a lot more power. On the other hand, they don’t lose too much on the fuel economy. It seems like the 2019 Ford Ecosport will bring the final redesign before the next generation. The second-gen model dates back to 2012, and the last facelift happened in 2017. But then only minor changes took place on subcompact SUV. Now, bigger modifications will include exterior and interior upgrades. Outside, the vehicle will keep its dimensions. So, the subcompact crossover comes with a wheelbase of just under 100 inches. The overall length of 2019 Ford Ecosport will be 160 inches. Width is 70 inches and height 65. Outside we will see some updates. The same 16-inch wheels will get a new look. Optionally, the SUV is carrying 17-inch rims. Grille and hood will lay lower than before. Its distinctive look is present again, but with new details, With grille, the front bumper goes lower than before. At the rear end, the situation is different. The new 2019 Ford Ecosport will stand somehow higher. Also, some design tweaks will round up the entire redesign. Apple CarPlay is a standard part of the Sync3 infotainment system. The company takes this class very seriously, and the lack of space designers will try to make up with long features list. There, buyers will find various accessories and equipment boosting different areas of the SUV. Safety packages, comfort sets, and entertaining groups of standard and additional parts are impressive. With 2019 Ecosport it won’t be boring. A mixture of comfort, driving impression, and fun factors is going to be incredible. 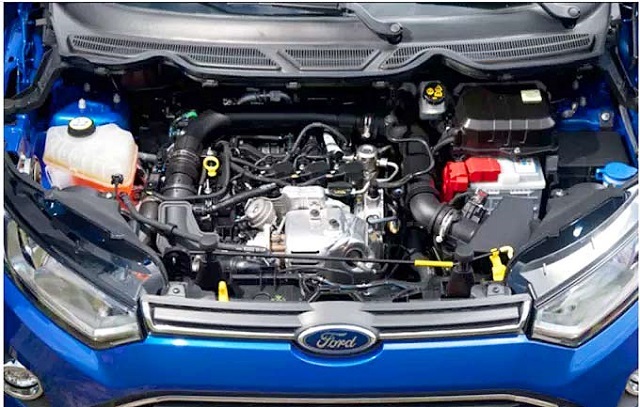 The 2019 Ford Ecosport rides on the 1.0-liter turbo engine. A three-cylinder unit might be small, but it is pretty capable. It pairs a six-speed automatic transmission for outputs of 125 hp and 125 lb-ft of torque. Another impressive feature about this crossover is all-wheel drive as the sole option. Well, we had no two-wheel drive for the current edition, and it could become the optional mode for next Ecosport. The alternative to a three-cylinder powertrain is an engine with one cylinder more. A 2.0-liter mill offers more power and torque, but it sticks up to the same transmission and drives mode. This engine can produce up to 165 hp and 150 pound-feet of twisting power. Both petrol engines are quite economical. Of course, the smaller unit returns the better mileage. But, the highway fuel consumption is the same at 30 mpg. It will be 1 mpg improvement compared to the current edition. City drive requires more change of gears and higher consumption. With a smaller engine, the difference is almost negligible. A 1.0-liter goes 27 mpg, while four-pot mill consumes 25 mpg. If buyers are not sure yet which one to choose, then they could take acceleration for decisive detail. If you are looking for a quicker vehicle, then the larger drivetrain is a better solution. Finally, towing capacity of the 2019 Ecosport is above 2,000 pounds.